After the first opening, you can reseal it by closing zipper to keep the freshness. 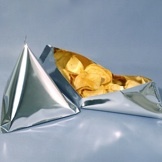 Tetrahedral three-dimensional shape protect its content with air in crowded bin of refrigerator. Pattruss Z is also resource saving and earth friendly since garbage after use is less than that of clam shell hard case. Pattruss Z is nominated for FLIA Award 2012. Pattruss stands at FRUIT LOGISTICA 2012 in Berlin on February 8-10. Please Visit Hall 26, Stand C-20. Pattruss family is widely used for various purposes and growing its variation. •Pattruss Z for Salads. Large Size. •Pattruss Vegie for Salads and Vegetables. •Pattruss Deli for Retort Foods and Frozen Foods. 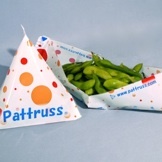 •Pattruss Snack for Snack Foods. Each family has different film are design for different contents. We customize film, size, exterior design for the best of your content. We also arrange the packaging facilities which is made for Pattruss. Upon your needs, a small sealing machine for shop counter, a semi-automatic sealing machine for a packaging center, a full-automatic packaging machine for a factory are available. See Products page for detail. Please send us an email to sales@pattruss.com for any inquiry. 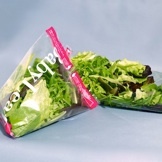 The Pattruss Z is the answer to the needs of wanting to eat fresh leaf salad vegetables with less frequent shopping. Pattruss Z has inherited all goodness of Pattruss series by nature like content protection, but also got larger sized and zippered for resealability. 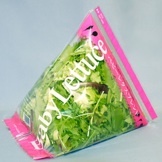 The synergy effect of 3 key features, that is long lasting freshness, larger sized bag, resealability by zipper allows consumers to eat fresh vegetables everyday without going out for shopping everyday. When you open it first time, you can prove that you are the first one by tearing the outside of zipper.